The On De Rock Craft Brewery is the brainchild of friends Dave Jones and Simon Watkinson. Dave had been brewing craft beer in Bermuda as a passionate hobby and shared the 100% Bermuda made craft beer with Simon. Simon, a great fan of quality craft brewed beers loved every beer that Dave created. Similarly, everyone that tasted the craft beers Dave made, loved them. Naturally, discussion changed into turning Dave's hobby into a business and the On De Rock Craft Brewery was born. 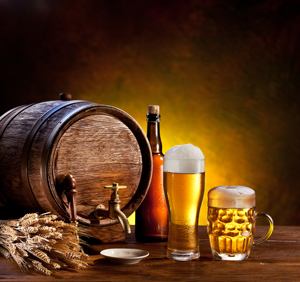 Brew beers using 3 kettle system including Hot Liquor Tank to preheat filtered brewing water, a 145 gallon Mash Tun to soak grain mixture to remove sugars producing a sweet wort mixture which is heated to specific temperatures to activate specific enzymes. Sweet wort is then pumped into Boil Kettle to boil from 60 – 90 minutes. Wort is then pumped through a plate chiller reducing temperature to suitable yeast pitching temperature and into fermenting vessel where it will be held for approximately 3 weeks depending on particular recipe. Once fermentation is complete, beer will be transferred into a brite tank for carbonation and final conditioning. Beer is then put into kegs and stored in cold room until released for sale.